The Inugami family meet in The Inugamis. The Skinny: Kon Ichikawa's remake of his own film has the same great story, but a curious and even distracting reverence in style, setting, music, acting, etc. Basically everything that was done in the original film is redone here, sometimes nearly shot-for-shot. A clever companion piece to the original Inugami Family, but that's about it. Director Kon Ichikawa's 2006 film The Inugamis is an odd production, as it appears to be just a reverent remake of the original 1976 film The Inugami Family that possesses little novelty besides an updated cast and a self-conscious affection for the original. In a rarity, Ichikawa remakes his own film; the veteran director handled the 1976 classic, and his reverent approach to the remake is a bit odd given the current vogue for director's cuts. Many directors consider rewriting history, looking for ways to tinker with their work instead of simply regurgitating it, but Ichikawa pretty much delivers a carbon copy of his original work. Is Ichikawa so happy with The Inugami Family that he doesn't feel the need to improve it in any way? One thing is certain: he didn't feel the need to improve upon his original actor. Koji Ishizaka reprises the central role of post-World War II detective Kosuke Kindaichi, a character he essayed numerous times throughout the seventies in many films also directed by Ichikawa. Ishizaka brings the same humble charm to the role, though he now has 30 years of lines and heft added to his body. Kindaichi is hired to investigate the rich Inugami family after the death of patriarch Sahei (Tatsuya Nakadai), but things get off to a bad start when Kindaichi spies the beautiful Tamayo (Nanako Matsushima) in a sinking boat in the middle of a lake. Kindaichi rescues her, but the implication is that someone connected to the Inugamis is out for Tamayo's blood. Soon after, the man who hired Kindaichi also dies from an apparent poisoning. Something is clearly rotten in the house of Inugami. The feeling goes from rotten to just plain murderous when Sahei's will is finally revealed. The will reading occurs at a family gathering, which includes not only Sahei's three daughters (all from different mothers), but also their children, including veteran Sukekiyo, who was disfigured in combat and wears an eerie white mask to hide his hideousness. His relatives suspect that he may not be the real Sukekiyo, but they have other problems, like the revelation that Tamayo is supposed to receive the entire Inugami fortune despite not being a blood-related family member. The deal is that she can share the fortune if she marries one of the Sahei's three grandsons - including the presumably undesirable Sukekiyo - but that option offers little immediate relief. As the family members jockey for the inheritance, an intricate web of lies, adultery, anger, lust, crime, and assorted dark doings is slowly uncovered. Piecing it all together is the affable, clever Kindaichi, constantly scratching his dandruff-afflicted head, cogs spinning all the while. 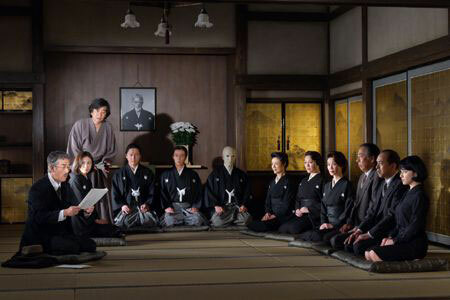 The original Inugami Family is revered as a classic, not only for its large box-office gross, but for its dark, involving mystery, and tangled web of relationships and motives, which criss-cross into a convincing whole. Since Inugamis features the exact same storyline as the original, the film automatically earns points as a compelling mystery about a dysfunctional post-war Japanese family and its untold secrets. What's questionable is Ichikawa's approach, as the film is not simply a remake, but a virtual shot-for-shot reenactment. Ishikawa takes care to ape his original work, and presents the remake with the same settings, costumes, music, pacing, and even shot framing of the original. There are some differences, including a few different shots, a little more blood, and different dialogue at Kindaichi's farewell, but otherwise, it's like you're watching the exact same film with an entirely different cast. With the exception of Koji Ishizaka, of course.